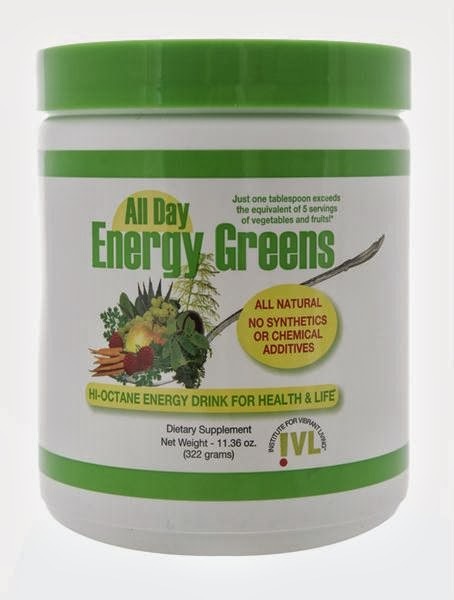 All Day Energy Greens (ADEG) by Institute of Vibrant Living, is a dietary supplement that exceeds the nutritional equivalent of five servings of fruits and vegetables. The ingredients make it the most potent, energizing, immune-enhancing green drink on the market. Best of all it’s been helping people lead healthier lives, have more energy, and lose weight. I have long been a supporter of green drink, and had started drinking green smoothies a couple of years ago. For me it is more about finding the time to get all of the fresh veggies together and blended up. More often than not I am missing a few ingredients that I need. All Day Energy Greens have been wonderful for me on those days! When I am not having time to make a smoothie, or am missing a key ingredient I can turn to a wonderful tasting, easy to use product in All Day Energy Greens. I have been leery about trying these drink mixes, for fear that they would taste chalking and just plain yuck. This is a wonderful drink mix! It dissolves thoroughly and completely in my juice. No weird chalky taste, or after taste. Really reminds me of drinking one of the cold smoothies! This drink when I had it first thing in the morning really did give me more energy that I get without breakfast. I didn't see a weight loss on my part, but with only two weeks and still eating normally I didn't expect to. If I wanted to go full force this would be a great way to loose weight. The All Day Energy Greens kept me full for a long time! I wasn't sure how my body would handle such a large amount of fruits and veggies, so I waited to drink my first one until I knew I would be home all day. I had zero problems with All Day Energy Greens. No stomach ache, cramps, bathroom issues. Not a single problem!! All natural, great tasting, full of energy!! I do highly recommend this product! !